The decision for a developer or end-user when looking at a potential development site is mostly based on the location of the subject property, explains Rainer Stenzhorn of In2assets, the South African based Commercial & Industrial Property Marketing Company. Finding and pioneering new attractive locations for investors or developers, is often a balancing act with a carefully measured approach which includes harmonizing location-based risk. Therefore, most investors will look at the greater picture and will carefully study the economical growths of a region and its potential future. The perfect example for such a well-positioned commercial & industrial precinct, is Umhlanga with its latest development “Cornubia New Town Centre”, explains Stenzhorn further. The new Cornubia Town Centre is poised for development as an environmentally-friendly business and mixed-use district and forms the nucleus of the inter-linked corporate business and affordable residential components, which dominate the overall Cornubia development. Cornubia is located on the intersection of the M41 and N2, adjacent to the New Cornubia Mall and Retail Park and south of the N2 Business Estate. The new multibillion Intersection on the N2 with various bridges linking Cornubia and Umhlanga is nearing its completion. This long awaited Road access will dictate the new pulse on the economic growth North of Durban and Dube Trade Port. Cornubia, planned in line with sustainable development principles, is designed to provide for KwaZulu-Natal's largest mixed-use, mixed income and fully-integrated human settlement. It provides for higher densities, a range of income levels and the stimulation of employment and economic opportunities, creating the basis for new housing, schools, clinics and other social infrastructure. Cornubia has emerged as a highly sought after residential and business location, with rapid uptake of commercial and industrial sites by developers, end-users and investors who recognise the development's attributes. Part of Cornubia, is Cornubia Industrial Business Estate which accommodates a wide range of uses including warehousing, assembly, service and light industrial, distribution, logistics, showrooms, offices and retail set within a landscape environment. 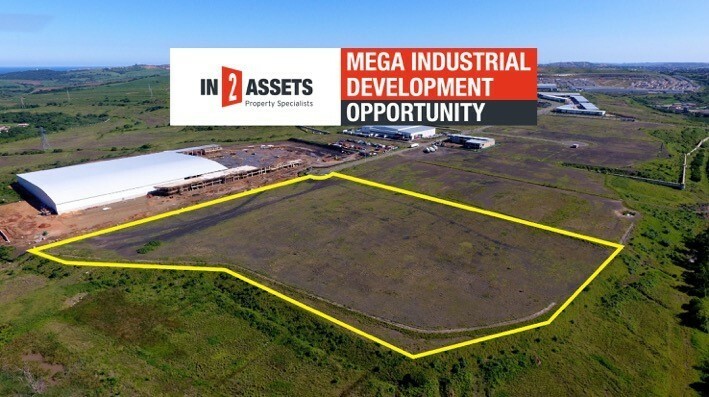 Property in this Business Estate is high in demand, and In2assets is proud to be appointed as sole agent to market and sell by public Auction, a ± 60.582 m² development site ends Stenzhorn. The subject platformed and fully serviced property offers the perfect opportunity for a national corporate, listed property company or end-user to get a chunk of the most prestigious position North of Durban. The Auction Sale will take place on the 21st of February 2018 at the Durban Country Club and more information on the property can be downloaded from www.in2assets.com or obtained directly from Auctioneer Andrew Miller via amiller@in2assets.com.